MONSTER CLASSIC is decisively different from any of the standard long pimpled rubbers with friction. Its combination of special pimple geometry, rubber formula and sponge enables aggressive blocking and counter-attacking close to the table. The rubber allows for either passive or active blocking against either very fast topspin shots or high rotation loops. The disruptive effect is no longer generated by the spin reversal properties of the frictionless long pimple rubbers, now banned. Instead, it comes through a fast and wobbling blocked return which tends to stay low after the bounce. The rubber is also designed to allow attacking of any ball which has been lifted or pushed without spin. An additional advantage is that MONSTER CLASSIC allows good control, particularly important for service returns. 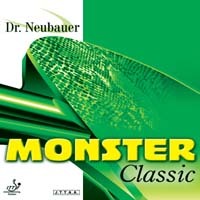 MONSTER CLASSIC offers a new standard for an aggressive game using long pimpled rubbers with friction.